Ahoy, TrailblazerGirls! We have some news about a fantastic company called Boatbound that’s an online “pier-to-pier” boat rental marketplace. All types of watercrafts are available to rent from SUPs to sailboats to fishing boats, even yachts! Towing and on-water assistance are available, if you run into any problems with your rental. 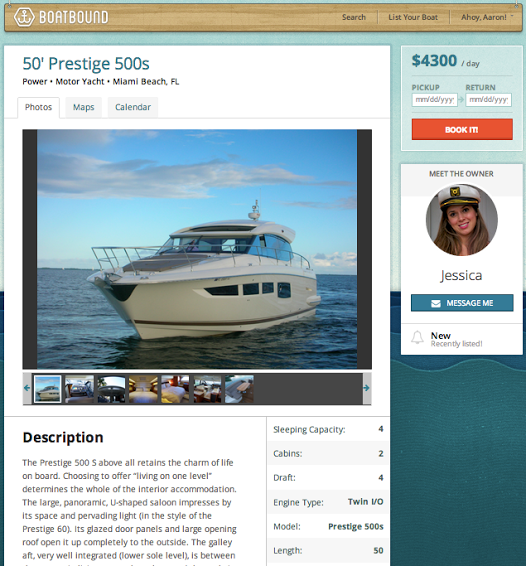 If you own a boat, you can earn money by listing it with Boatbound and renting it to pre-screened, qualified renters. Additionally, Boatbound provides up to $1 million in liability protection and up to $2 million in hull damage protection with every rental. Though headquartered in San Francisco, rentals are available all over the US. On top of that, it’s completely free – no membership or monthly dues! Okay, water-loving TrailblazerGirls, here’s another great way to get out on the water!